For September’s 12 Months to a Healthier You Challenge, we’re focusing on clearing out clutter. I committed to spend 30 minutes to an hour every week de-cluttering at my house. I decided to tackle the office. 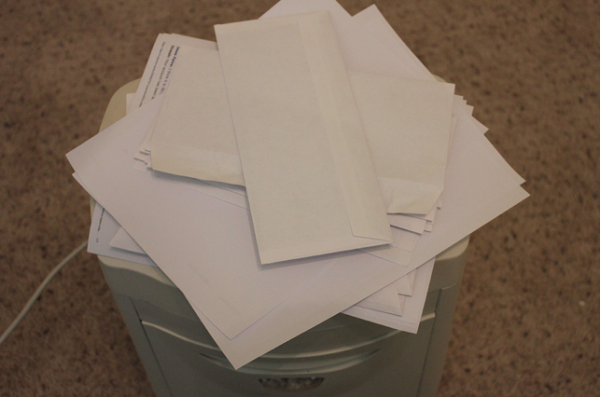 First up, I shredded this pile of papers that had been waiting by the shredder to shred. 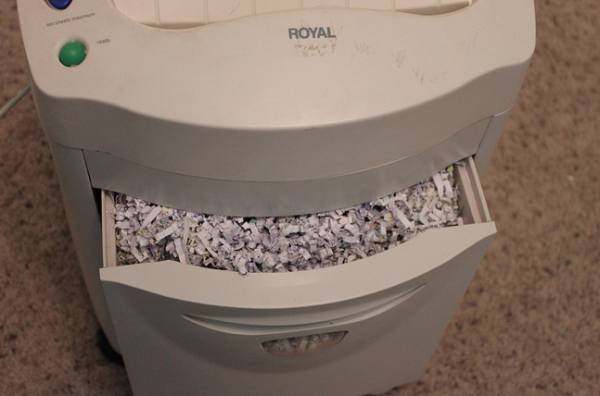 After doing the shredding, I realized that the shredder desperately needed to be cleaned out. 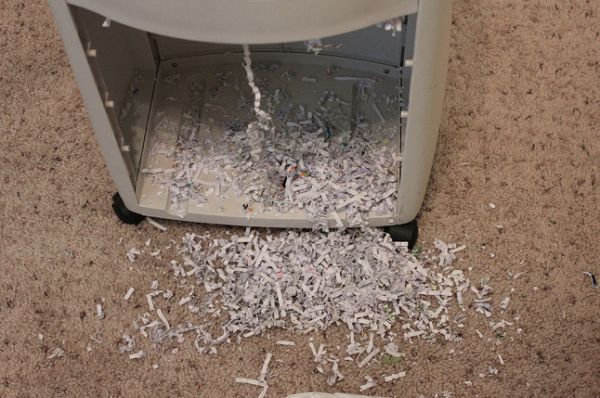 So, I proceeded to try to dump it out into a bag… and promptly made a mess in the process. By the time the mess was cleaned up and I’d vacuumed the floor, my 30 minutes were up! Did you do any de-cluttering this past week? If so, how’d it go for you? You know what? After my decluttering session, I was so encouraged. Why? Well, recently, I’ve been feeling like the clutter has been creeping in. And as you have probably figured out, I don’t like clutter. Er, more like, I loathe clutter. I figured that this challenge was going to be easy because I’ve not de-cluttered much at all since we moved in May. Well, guess, what? I had trouble finding clutter today! In fact, mostly what I found were things we use on a regular basis or have plans to use very soon. As I analyzed it more, I think the reason I’ve been feeling like we have more clutter is not so much because we’ve been lowering our standards, but because we down-sized in house when we moved, my husband brought his office home, and our floor plan is laid out so differently here. This left me feeling so encouraged! And it also made me have new appreciation for those of you who are currently living in really tiny houses or apartments. Anyway, here’s a picture of what 30 minutes of digging through closets and dressers and drawers produced. 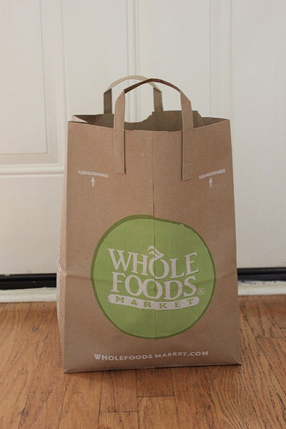 A half-filled grocery sack. Note: I kind of fell off the bandwagon with this series in August. My goal-setting post for this week (coming in a bit) will explain why. Thanks for your patience with me. I’m excited to get back to this series again! One of my goals for 2014 is to focus on my health. It’s easy to let our health take a back burner to everything else on our to-do list. But as I share in my new book, Say Goodbye to Survival Mode, I’ve experienced what happens when you put your health last… and it’s not pretty! We’re be focusing on one challenge area each month — all with the goal of being in a healthier place as a person by the end of next year. My hope is that as we work on instilling one new healthy habit each month, they won’t just be month-long challenges, but lifelong changes. My goal for September is to spend at least 30 minutes to an hour every week this month focusing on decluttering. I plan to share a post with my pictures and results of my decluttering each Monday this month. Will you be joining me for this September Challenge? If so, leave a comment letting us know you’re planning to join and what your decluttering goals are — whether it’s an area of the house you plan to tackle or a certain amount of time you plan to spend. Remember to keep them simple and doable! 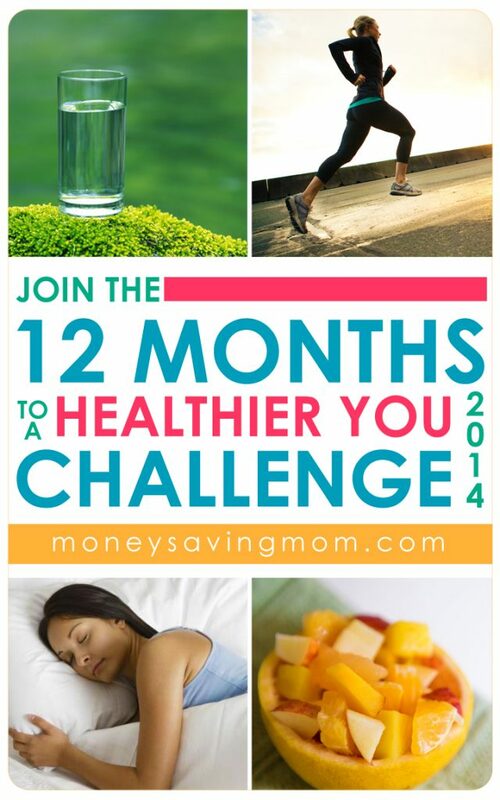 Are you joining us for the 12 Months to a Healthier You Challenge? If so, it’s time for our weekly check-in to post our progress. We’re focusing on developing the habit reading more. I grow and learn so much through the books I read — which is why I included this as part of the 12 Months to a Healthier You challenge. I think filling our mind with good things can transform our whole life — from the inside out. I’m hoping to read at least 20 books in July. I read 4 books last week — yay! That’s progress over last week’s 2 books. And since we’re taking a roadtrip this week, I’m hopeful that I’ll have time to read even more. We’ll see! I hit my water goals six of the days, ate a salad six days, got around 8 hours of sleep almost every single night (woot! ), did a fairly good job of sticking with my morning routine, exercised 4 times, and had dessert once. I’m so encouraged with how these challenges are actually turning into true habits for me — and hopefully lifelong changes! So far, I’ve only read 2 books, but I was also traveling and out of town, so I’m hoping that I’m going to be able to step it up with reading now that I’m going to be home more the rest of this month. We’ll see! I hit my water goals six of the days, ate a salad six days, got an average of 7.5 hours of sleep (yay! ), did a fairly good job of sticking with my morning routine, and had dessert twice. The only area I really bombed was exercise — I didn’t exercise one single day. Yep, bad, I know. But I aim to change that this week! I grow and learn so much through the books I read — which is why I included this as part of the 12 Months to a Healthier You challenge. I think filling our mind with good things can transform our whole life — from the inside out. I’m also hoping to keep up with January’s habit of exercising at least 4-5 times every week, February’s goal of eating a big salad at least six times a week, March’s goal of drinking 8 glasses of water a day, April’s goal of cutting back on sugar, and May’s goal of getting at least 7.5 hours of sleep every night, and June’s goal of having a more consistent morning routine. Will you be joining me for this July Challenge? If so, leave a comment letting us know you’re planning to join and what your Reading More goal will be for this month.